August | 2012 | Pray for Revival! Would Spiritual Revival Change Anything? What would revival change about your life? My husband and I were burdened to gather Christians together to pray for spiritual awakening. After we learned about OneCry, we spent three months sharing this vision. We had no idea how much God was going to do in US during that time! He revived our marriage. We felt like we were on a second honeymoon—only this one was better than the first! Our desire to pray increased, and we found new enjoyment in prayer. We began to see more answers to specific prayers, which amazed us. This increased my faith. I am praying with more belief that God is going to work in revival in our church, community, friends, and family. I have never, ever had this kind of faith before. I’ve begun to worship more and more. Previously, during worship times at church, I remember thinking, “I don’t really believe or practice what I’m singing about. I feel like a hypocrite.” Now I am so excited to worship God and praise Jesus for what He has done and will do. His gospel is sweet! I’ve experienced an increased desire to serve. I had been coming to dread doing anything in the church; and when I did, it was totally out of duty, not out of a desire to serve Christ or out of thankfulness. Another huge change has been my desire to give monetarily. I used to be a tightwad, but the Lord has set me free from that! I now have an increased desire to tell others about Jesus and the gospel. We have been doing this once a month now for several years. The Good News? Four prodigals have come back home to their Heavenly Father! 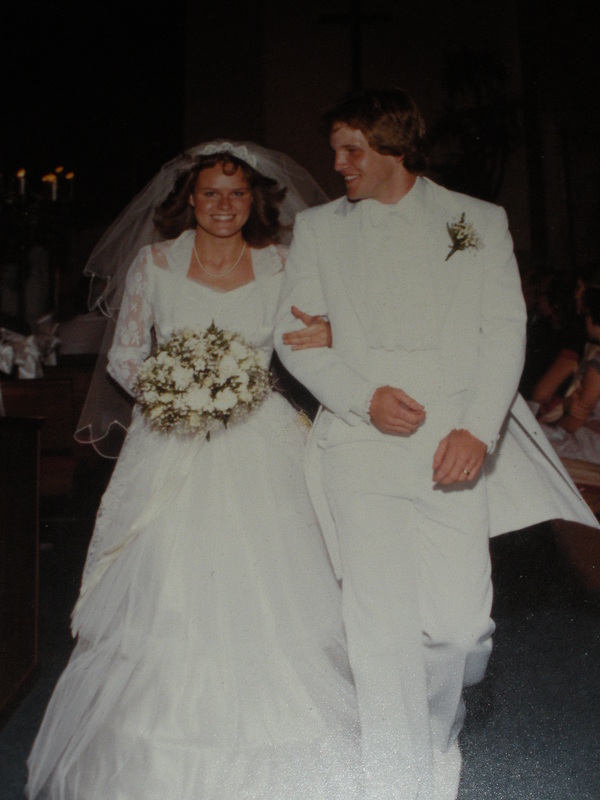 Our wedding ceremony took place at Salem Baptist Church in New Brighton, MN on August 28, 1982. What Is the Condition of Our Hearts When We Pray? 1. That the strongholds within your country to be broken so that a new wave of revival may be released. 2. God will enable a prayer force to be mobilized to reach other unreached parts of your nation. 3.Pray that all Christians will be awakened into evangelization both locally and internationally. 4. Pray for the mobilization of Pastors, leaders, believers and intercessors in your country to awaken in prayers. 5. Pray that God will release a spirit of conviction and repentance upon your nation that millions of souls may get saved. 6. Pray for God to provide all the finances, favor and grace for all the resources thatare needed for evangelism. 7. Pray for divine protection of your Christian leaders, that God will grant them protection, wisdom and favour. 8. Pray that God will give prophetic direction for the Nation. 9. Pray for Peace, godly leadership and godly counsel to the Government. We Must Pray If We Are to Become More Like Jesus! It will involve a consistent prayer life. I have been asked to be the honorary chairman of the National Day of Prayer for 2013. Shirley Dobson, who has done such a wonderful job of overseeing this significant ministry to our country, called me and asked if I would take on this role and of course I agreed. Billy and Franklin Graham, David Jeremiah, and many others. Are There People in Your Church Who Are Prayer Shield For the Pastor and Leaders? Whether you are an intercessor or a pastor, one of the most important things you can do as you seek to make your church a house of prayer is to develop a prayer shield for pastors and leaders in your church. (Mell Winger quoted in My House Shall Be a House of Prayer by Jonathan L. Graf and Lani C. Hinkle, 18). Prays about what it does. Prays when there are problems. Announces a special time of prayer-some in the church up. Asks God to bless what it is doing. Is frustrated by financial shortfall-backs down from projects. Is tired, weary, stressed out. Does things within its means. Sees it members as its parish. Is involved in the work of man. Prays when there are opportunities. Announces a special time of prayer-the entire church shows up. Asks God to enable to do what He is blessing. Is challenged by financial shortfall-calls for fasting, prayer and faith. Mounts up with wings like eagles, runs and doesn’t grow weary, walks and does not faint. Does things beyonds its means. Sees the world as its parish. Is involved in the work of God. (Fred A. Hartley III quoted in My House Shall Be a House of Prayer by Jonathan L. Graf and Lani C. Hinkle, 9). Are We Sitting at the Feet of Jesus?